Dune climbers take the easy way back down to the beach. 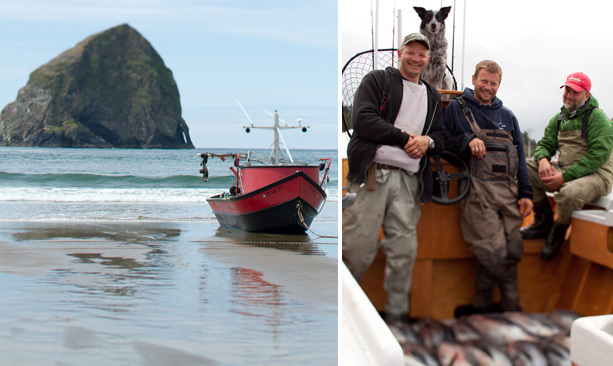 The dory boat fishermen have been launching into the surf at Pacific City for nearly 100 years. Listen for the toots of their horns as they return to shore near Haystack Rock. 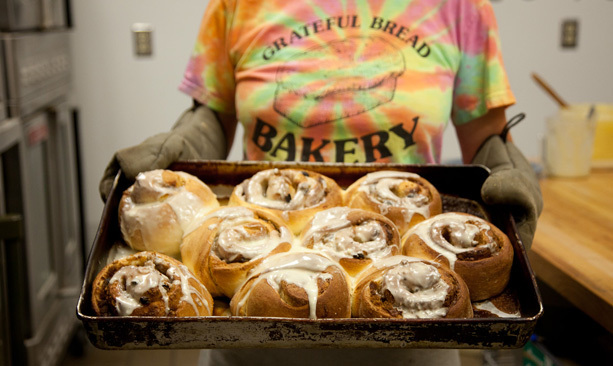 Fresh cinnamon rolls come out of the oven hot and fresh at Grateful Bread Bakery & Restaurant. 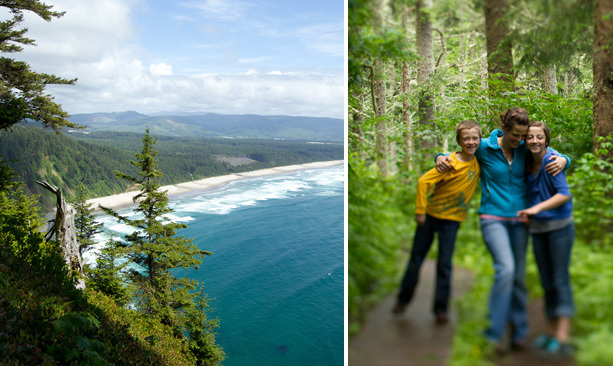 The Cape Lookout Trail, a moderate, five-mile out-and-back through the moist woods north of Pacific City, is a great hike for families. 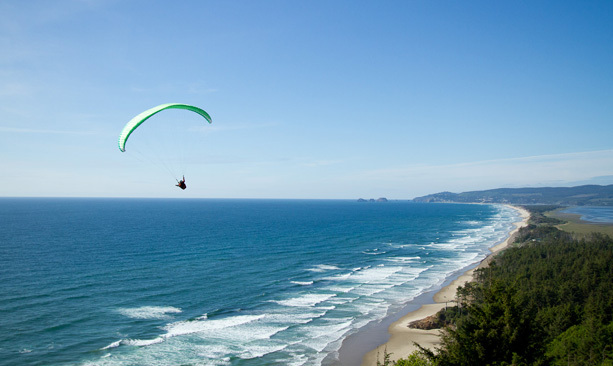 A paraglider launches off the cliff just north of Cape Lookout State Park. You don't have to jump to get a look at Netarts Bay and the town of Oceanside in the distance. 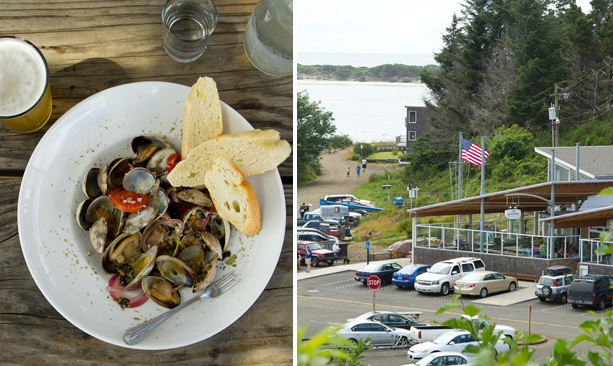 Enjoy a waterside lunch at The Schooner Restaurant at Netarts Bay. 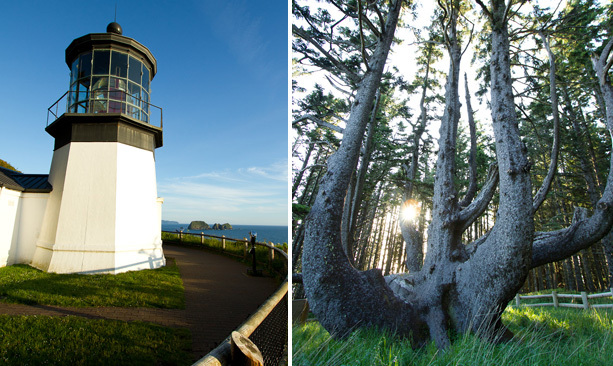 The restored 1890 lighthouse at Cape Meares is just a short walk from the parking lot, as is the distinctive and mysterious Octopus Tree. 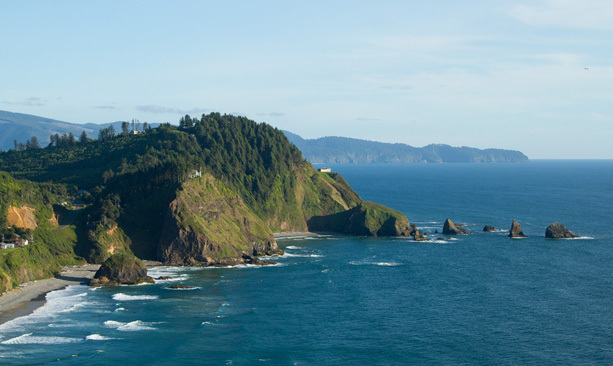 Cape Meares offers this vista of the coastline to the south. Looking north, one can see nesting tufted puffins, pelagic cormorants and seals on Cape Meares Rocks, a wildlife refuge just offshore. 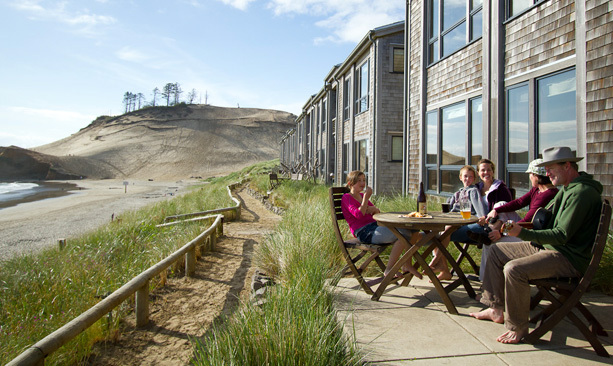 Relax on the beachside patio at the Cottages at Cape Kiwanda. Breakfast, lunch, dinner or an afternoon snack? How about a cold pint of award-winning pint of brew? Pelican Pub & Brewery can satisfy any and all appetites, including the kids'. An early morning paddle in the Nestucca Bay National Wildlife Refuge sets the pace for another beautiful day in Pacific City. We’ve been in the cramped confines of the family minivan for hours, it’s threatening to rain and the slope looks insurmountable, but these children are adamant: Cape Kiwanda must be climbed. “Come! On!” 9-year-old Nicola yells back over his shoulder at his sister, Sophia, 11, and our pack of slow adults. 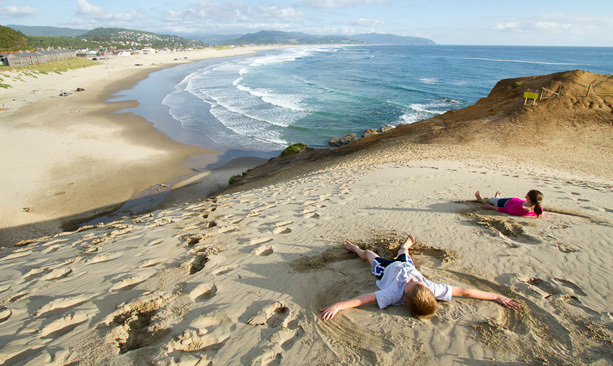 Digging, backsliding, laughing and falling, we inch our way to the top of the towering dune to drink in the dramatic view of the Three Capes Scenic Loop of the Northern Oregon Coast. Cape Kiwanda, the southernmost of the three capes, is located in the sweet little beach town of Pacific City, just two hours southwest of Portland. 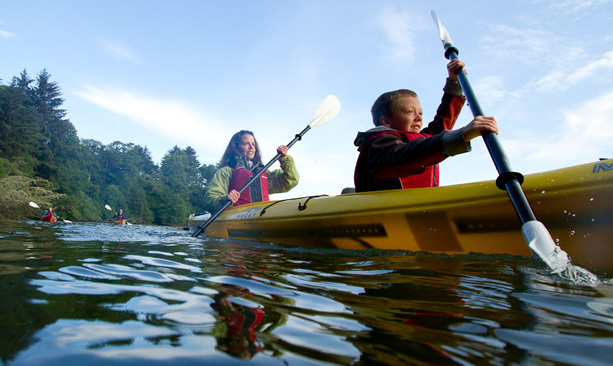 Peopled in the 19th century by dairy farmers, fishermen and loggers, the town now offers a host of pleasing activities for kids and adults. The little town on the Nestucca River and just off Highway 101 has drawn us out for a weekend of beachcombing, hiking, sea kayaking and, lest it be forgotten, dune climbing. The beach is the heart of Pacific City. Rising out of the waves just offshore, the 327-foot Haystack Rock (taller and lesser known than the one in Cannon Beach) is awash with sunshine, a blue sky unfurled above. The broad, clean sweep of beach draws all ages down to the water throughout the day. By 8 a.m., a knot of surfers has congregated to assess conditions. Soon they are a bobbing line on the horizon, taking turns riding in on the rushing white crests of waves. Dory boats, which launched directly into the surf at sunrise, toot their horns upon return to the beach. Excited dogs run in large, yappy circles around groups of teenagers splashing in the waves. Toddlers stoop to grab sand and release streaming handfuls to the beach. All told, it looks like something from a movie set, especially from the patio of the Pelican Pub & Brewery at sunset on Friday evening. We’ve come to conquer the capes, so Saturday morning finds us hiking the Cape Lookout Trail, a moderate, five-mile out-and-back through the moist woods north of Pacific City. Its precipitous lookouts offer gorgeous views south to Haystack Rock and north to Three Arch Rocks National Wildlife Refuge near Cape Meares. The trees are full of the music of birds that dart across the trail as we walk. Gulls, eagles and cormorants soar, impossibly, below us as the trail climbs. Nicola and Sophia claim to be tired but are somehow running ahead of the rest of us back to the van. Cape Meares is more easily bagged. It is just a short walk from the parking lot to the restored 1890 lighthouse at the point and views of nesting tufted puffins, pelagic cormorants and seals on Cape Meares Rocks, a wildlife refuge just offshore. Sunday morning, we rallied for a sunrise paddle through the Nestucca Bay National Wildlife Refuge with the friendly folks from Kayak Tillamook. 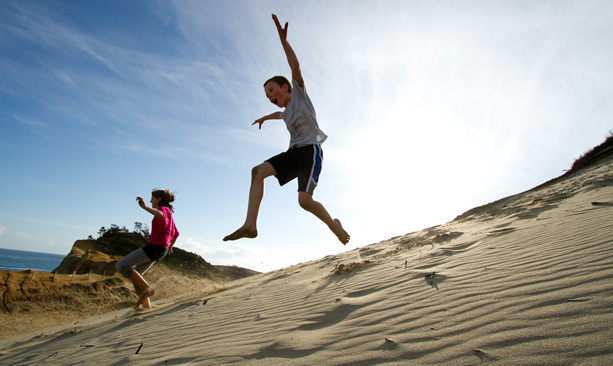 The refuge is one of six that make up the Oregon Coast National Wildlife Refuge Complex and part of the Tillamook County Water Trail system, recently designated as a national recreation trail. With the morning mist still hanging in the nearby hills, we glided with the tide toward the ocean. Red-winged blackbirds trilled to each other from the reeds. We passed a cluster of herons on the sandbar in the middle of the river, bald eagles perched in trees and swooping osprey, and the curious and dog-like faces of two harbor seals periscoped out of the water to check us out before sinking down again. At the end of the weekend, I asked the kids what had been the most fun for them. Was it the dune climbing, the hiking or the paddling? Sophia shrugged, digging into her well-earned dinner, and Nicola dozed over his plate. But no matter, it was clear that the beach won, hands down. “Can we go back down to the beach now? Please?” replaced the refrain, “Are we there yet?” During our weekend, the kids raced off the patio and down into the sand over and over again. If the beach is their favorite part of the weekend, it’s ours, too, we adults who want to sit on the deck at the Cottages at Cape Kiwanda and drink in the sound of the crashing waves and crying gulls. But the cottage itself earned my gold star for the weekend. Gorgeous and comfortable, it sported a fully loaded kitchen, lovely fir trim and cabinets, a fireplace and a dining nook. Three bedrooms offered plenty of room for kids and adults. 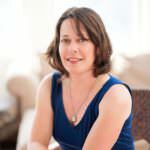 In the master bedroom, the Jacuzzi tub begged to be soaked in, and large windows looked out from the king-size bed onto Haystack Rock. We left the blinds open and fell asleep watching the light of an anchored boat rise and fall with the swell of waves on the horizon, dreaming of our next trip to Pacific City. 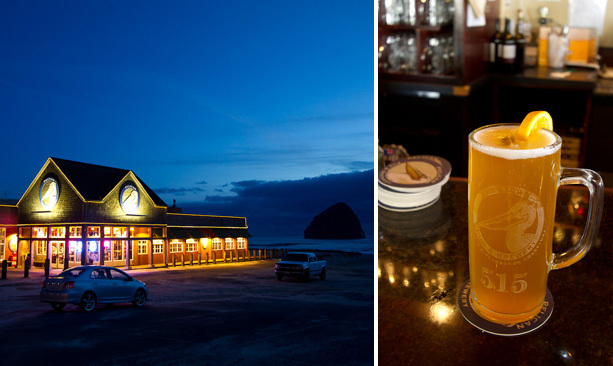 Pelican Pub & Brewery: Don’t miss the award-winning beer, tasty pizzas, fresh, local seafood offerings and a lively patio right on the beach. Grateful Bread Bakery & Restaurant: The restaurant has excellent and tasty breakfast and lunch, as well as fresh breads, pastries and other baked goodies. Stimulus Espresso Café: Get your morning cup for a stroll down the beach or stop in for an afternoon pick-me-up.